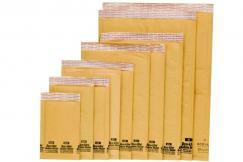 These bubble mailers provide outstanding low cost shipping protection for a wide variety of products. Online Retail, CD/Music, Fullfilment/Logistics, Cosmetics, Consumer Retail. Ecolites are made from golden kraft paper with a 1/8" Durabubble lining.